The first thing to do is to identify what you have seen. Have you noticed mud like soil deposits normally with mushrooms growing out of the soil inside or outside your dwelling or building? If so, you probably do have a subterranean termite infestation. We have the solution for you. Contact our offices and our sales agents will make arrangements for one of our trained Consultants to come out to your home or business to identify the infestation at hand and provide you with the best possible advice, recommendations and will provide you with a free quotation. Once the quotation is accepted, we will have the service booked in with you on a suitable date. Our technician will first report to the client and find out where the infestation has been reported. He will check the area and confirm with you where he will begin the service. All pets and children and anyone with breathing difficulties such as asthma and the elderly at this point should be removed from the area of treatment for preventative safety purposes. If an infestation is evident inside, our technician will first (where applicable) remove skirting boards that are damaged to make space for the application procedure. He will then start by drilling holes internally at 1-metre intervals as to penetrate through the slab within the infested areas as per the SABS Code 0124. The holes are approximately 12 mm in diameter and the around 450-500 mm long. Our technician will then proceed outside and drill holes externally around the perimeter of the dwelling/ building at 1-meter intervals, at a 45-degree angle- this is to penetrate the cavity section of the weight bearing walls where termites would move between the bricks. All drilled up soil is removed and swept up before the injection process commences. A registered termiticide will then be injected into the holes that have been drilled under high pressure with a pressurized motorized pump. This is to create a chemical barrier in the foundation wall cavity and be present below foundation level to prevent termites from penetrating this barrier. The product dries and crystalizes with the soil so it can stay active for the duration of the 5 year guarantee period of the area treated. Our technician will seal up all holes with cement and will also ensure there is no chemical residue left that will be cleaned up. He will then provide you with a service report. The guarantee certificate will be issued to you on receipt of payment. If you are building a new home or a new building, why not consider having your foundation pre-treated as a preventative measure to keep it termite proof for at least the first 5 years? This is really beneficial to property developers and architects when you are in the planning stages of a development and can save thousands of Rands down the line. You can even undertake this application if you are extending your home or building and wanting that piece of mind. This process can simply be undertaken during the construction process when your builder has compacted the soil and is just about ready to lay down the plastic damp course lining. The termiticide would be applied onto the exposed soil area and trenches with a motorised high-pressure sprayer prior to the concrete being poured when the builder lays the slab. Some Termites build their mounds to a height of 3 meters above ground level. In some countries in the world, Termites cause more damage per annum than fires. Buildings or homes within a 50-meter radius of a termite nest are subject to attack. As the description of their name indicates- these termites occur beneath the surface of the ground. They are social insects and have a strict caste system, consisting of the workers, soldiers, winged termites (re-productive Alates), a queen and a King. They are white in colour, soft bodied and possess hard shelled jaws which allow them to chew through their natural diet of wood and related food sources. 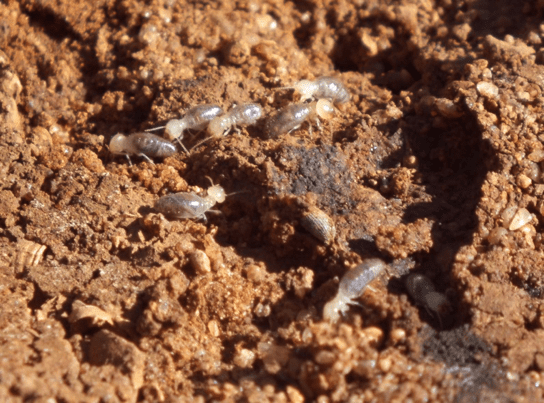 Subterranean termites feed exclusively on dry wood and any wood product that contains cellulose. The cellulose content is extracted from the wood and is digested with the aid of Micro-organisms within their digestive systems and is used for the sustenance of the colony. Sub Terranean termites would feed on the dry wood within the bark of trees; however, they do not feed on living trees or plants. One very common sign are flying ants which are normally visible with the first summer rains- these are in fact the alates which form new colonies. Subterranean termites infest houses, buildings and any structure that has a concrete or wooden subfloor, where they enter from beneath the foundations and make their way up through any structural crack, cable conduit, plug points as well as the cavity existing within weight bearing walls of structures, and if left without being attended to they can move into one’s roof and start a new sub nest in the roof which can lead to an enormous repair for the owner when the rafters are damaged. Do you have subterranean termites? Have you noticed infestation such as in the picture above on the external perimeters of your house or within your skirting boards, near or within wooden door frames and window frames? If yes, it is highly likely to be activity. 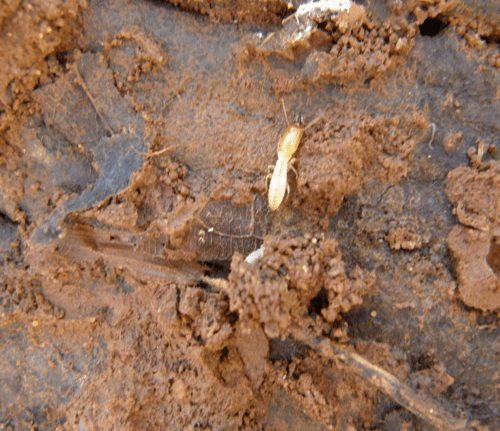 Is there any sign of winged termites around your premises, with or without their wings? If yes, it is possible a new colony may develop. Do you see loose heaps of soil next to your skirting, door frames or around the external perimeters of your home or business similar to the following picture? If yes, you do not have a subterranean termite infestation, but a black ant infestation. If you have answered yes to the questions above, rather call in the services of a pest control specialist that has experience in the industry, a proven track record and a company with public liability that will come in and undertake an inspection for you and provide you with recommendations and a treatment plan. Ensure the company you utilize offers you the correct 5-year guarantee on the foundation treatment of your structure. If any company or individual offers any guarantee longer than 5 years, this should be reconsidered as the recommended guarantee period is stipulated by the manufacturer as per the termiticides label. Do not be afraid that your house will collapse if you notice new subterranean termite infestation- termites work slowly, and would take a few months for extensive damage to take place. Flick is here to provide a solution for any termite infestation you may encounter. Give us a ring or be in touch on our website or drop us a comment on our blog or social media platforms.